Michele Dwyer at Putters Grill, located in the Sparwood Leisure Centre, has been in the food service industry for her whole life. She started out working for many years with other grill owners. "My standards of customer service and fresh quality food were much higher that's why I opened my own place," she said. Dwyer cooks everything from fresh produce and products everyday. Her food is "all made in-house from scratch." She even uses "fresh eggs" from chickens at her farm. If you order a hamburger, its not a frozen slab of meat and filler. Her burgers are made from fresh ground beef obtained from the local butcher. You will also find home made soup and muffins on the menu, but the biggest seller at Putters are the fries. Made from fresh potatoes and hand cut each day. No frozen bagged fries here. Dwyer has a single flavour Carpigini soft ice cream machine that allows her to make the best shakes and cones in the Elk Valley. Be sure to stop by Wednesday's, it's doughnut day. Home made fresh doughnuts you won't find anywhere else in town. POS-n-go's been part of Dwyer's business for the last year or so. "It's very easy to use and learn," she said. The students she hires pick up its operation "very fast. They even show me a thing or two," she said. 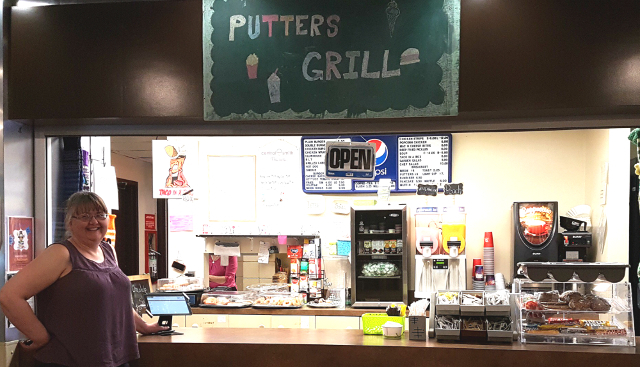 Be sure to drop in to Putters Grill, 367 Pine Avenue, Sparwood, BC, located inside the Leisure Centre.